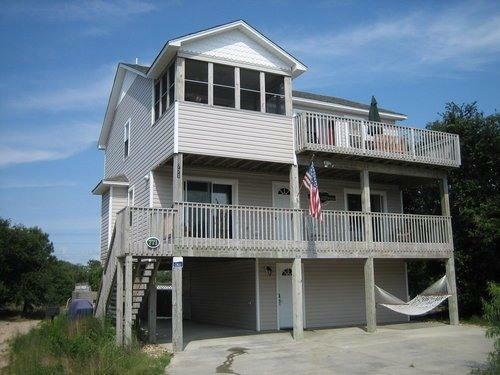 This well-appointed Corolla home (Ocean Sands, Section J) is perfect for family and group vacationing. Located close to the beach, Ocean Lake, shopping, restaurants and family activities. Enjoy the private pool (available early May), generous deck space, hot tub, hardwood floors throughout, recreation room and family-friendly touches. Ground Level: Rec room w/TV, Stereo USB-device ready, Single Sleep Sofa, hardwood floors, pool table, wet bar, full bath, Desktop PC. Mid Level: two Queen bedrooms w/LCD TV/DVD, hardwood floors throughout, a bedroom w/2 Singles w/LCD TV/DVD, one bedroom w/2 Bunk Sets w/LCD TV/DVD, two full baths and opens to spacious deck. Top Level: Hardwood floors throughout, King MBR suite w/private bath and LCD TV, screened porch, large great room w/42" Plasma HDTV/DVD, large couch, 1/2 bath, stereo w/CD, surround sound system with Bluetooth-ready stereo. Well equipped kitchen, dining area (seats 6), breakfast bar (seats 4) and opens to upper sun deck w/picnic table and screened porch with lots of seating and comfort. Other amenities: 4-slice bagel toaster, griddle hot plate, blender, Keurig coffee machine, coffee pot, Wusthof knives, microwave, cutting boards; loads of cookware, drinking glasses, wine glasses, flatware, utensils; Central AC/Heat. Wireless and High Speed Internet. Non-family groups considered (additional fees may apply). Tequila Sunrise is nestled in Ocean Sands, Section J, in Corolla. Located on a cul-de-sac on the oceanside, our house is a 700-yard walk to the beach (through quiet neighborhood streets and beach access paths; no major roads to cross; very safe). HUGE Beaches!! Ocean Lake sits at the top of our street and makes for a nice walk or playground for little ones and dogs. Convenient location less than 1 mile from golf, grocery stores, restaurants, spas, tennis, Brew-Thru and more...sunsets, warm breezes, surf, sand and more just outside the door. You can walk to the beach from the house. The house is located on the oceanside and is a 7-10 minute walk from our house. I recommend bringing or renting bikes if you want to. We have wagons at the house for toting beach stuff and young ones. Our house is located near shopping, restaurants, golf, mini-golf and more--all less than 1 mile away. A short 25 minute drive north to Corolla Light has 4x4 zone, wild horses and the famous lighthouse. 30-45 minute drive south to Nags Head has restaurants, movies, mini-golf and more. Our house is located at 771 Cormorant Trail, Corolla, NC 27927. Once you turn onto NC12, travel north for 15.5 miles. Go past the Currituck Club and Harris Teeter on your left and turn right onto Seabird Way. Take the first left onto Cormorant Trail and follow to the cul-de-sac. Our house is at "1 o'clock" on the cul-de-sac. We have parking for 4-5 vehicles, so please plan accordingly based on the size of your vehicle. No cars can be parked in the street or they will be towed. During your stay, the best way to reach me is via mobile phone. Also, if you need service on the pool, AC, etc, a list of service partners can be found in the Vacation packet. My siblings and I did a partial week at this house. It was easy to book, easy to check in, and we had a great time. There was 10 adults, 2 children, and a dog, and we had plenty of space. We utilized the wagons to get our stuff to the beach, and there were plenty of kitchen supplies for cooking/baking. We could not find the DVD's, but we didn't have any time to watch one anyways. Great house for making family memories. Loved our stay here. Very clean and loved that it had all the little things for the kids. Sean was great to work with and made sure our stay was comfortable. We'll be going back! My family had a great time the week we stayed. Very close to shopping, grocerys and great seafood. house is very well equipped with just about everything you could need. The beach was a bit far for the elders to walk but we did take our 4 wheel drive to corolla beach instead, very close and easy. Would like to see some updating to the pool, outdoor area and rec area. Other than that the house is perfect. We really had an awesome time at the Outer Banks. Sean (the owner) was amazing through the entire rental process with communication. He answered questions before we booked, was in contact with us before we left on vacation, and was available to answer questions during the vacation. He has a beautiful, spacious home with lots of space for lounging around. Our daughter had plenty of room to play while at the house and the neighborhood is very quiet and kid friendly. After a day on the beach it was great to relax in the swimming pool, hot tub and game room. We truly enjoyed our stay! Thank you Sean. This house was very spacious & clean. There were plenty of supplies including beach toys, kids toys in the house, linens, baby equipment, any kitchen supplies you could need. It was a pleasure to stay in this home, we felt like guests in a friend's house rather than just renters. The owner, Sean, was so helpful in answering any questions we had before the trip and he stayed in constant communication even through and after our stay. We would definitely recommend this house and will plan to stay there again if we return to Corolla. Thanks for everything Sean! We had a wonderful time - close to 4-wheel drive area, which we went to every day. House is stocked with plenty of dvds, nice bedrooms, all you need for the beach is right there! We chose this cottage because we wanted to be close to the beach and we wanted a pool and hot tub. The walk to the beach was so short we could easily run back to the cottage to grab another towel or chair. The pathway to the beach was a walkway that allowed us not to plow through the sand just to get to the beach. The pool was the real treat for us! It was just so relaxing to sit by the pool, spend time splashing about --or even just float around. The cottage was well stocked with all the items we needed to prepare meals. We especially liked the gas grill. And to top it all off, after a day in the sun, dinner that always tasted great after being in the sun and water, there were multiple TV's so everyone was happy. It was one of our favorite vacations ever!